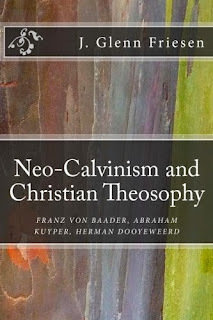 Part 2 of an interview with Glenn Friesen about his newly published book Neo-Calvinism and Christian Theosophy. Part One was here. You have addressed some of these issues in the book before - what have the responses to them been? In 2003 I published my article “The Mystical Dooyeweerd: The relation of his thought to Franz von Baader.” The reaction was one of consternation. Although he had no previous knowledge of Baader, D.F.M. Strauss wrote an article opposing my ideas. He did not mention Kuyper’s positive appreciation for Baader, even though I had discussed this on the online reformational discussion group “Thinknet.” And he mistranslated some of what Baader says. On Thinknet, I encountered a surprising amount of bullying, rudeness, and ad hominem arguments. I had not expected this from Christian scholars. There seemed to be almost no interest in any text-based analysis to see what Dooyeweerd had really said, but only aggressive and defensive rhetoric. On the other hand, through Thinknet I did meet some people like you whom I respect and with whom I have tried to stay in touch. What has the response to the book been so far? It is still very early, but so far I am very encouraged by the responses. There seems to be a new interest in exploring the historical issues that I have raised, and in finding out more about Franz von Baader and Christian theosophy. Why do you think it prompted those responses? Good question. I think having all of this information in one book makes it much more difficult to ignore the historical issues that I raise. I also think that the passage of time has helped. It is more than 10 years since I first wrote my first article using comparative philosophy. Since then, other historical research (my own, as well as research by others like Lieuwe Mietus) has confirmed my initial assessment. Does it matter that Dooyeweerd was influenced by Baader? What issues are at stake here? As Peter Koslowski (former professor at the Free University) said, Baader was a great Christian. So if we are concerned only about Dooyeweerd’s philosophy being a Christian philosophy, then it does not matter that it does not find its source in Calvin. You will find more references to Christ in my book than in most books on reformational philosophy. Baader had a very high view of Christ, and of the Trinity. But won’t some people be upset by the connection to Christian theosophy? Yes, those who view Dooyeweerd in terms of traditional Calvinism will have to adjust their views. He was not a traditional Calvinist. Nor was Kuyper. These people can give up their Calvinism. Or they can give up Dooyeweerd and neo-Calvinism. 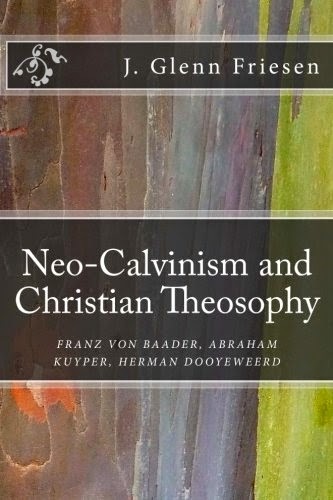 Both options will be painful, particularly for those who have spent their entire careers teaching that Dooyeweerd’s philosophy is Calvinistic. Dooyeweerd regretted that he used the term ‘Calvinistic’ to describe his philosophy. He appealed for a more ecumenical outlook. Those who emphasize the idea of “religious antithesis” as a dividing line between groups of people will also be unhappy. These people try to use Dooyeweerd’s philosophy in an “us versus them” kind of way. But Dooyeweerd says that the line of antithesis does not run between groups of people, but within our own hearts. Even Christians sometimes act in ways contrary to a Christian worldview. Baader was a Catholic. Doesn’t Dooyeweerd oppose Catholic thought as being based on a ground-motive of nature/grace? Would you describe yourself as a theist, a panentheist or a pantheist? Why? My own views are not really relevant for a history of the sources of Dooyeweerd’s philosophy. But it should be pointed out that for some reason, pantheism seems to be the biggest fear of reformational philosophers. They seem concerned to place as much of a boundary as they can between God and creation. Too often, this boundary has prevented a close experiential relationship with God. Dooyeweerd gives a different explanation of boundary. That does not mean I am defending pantheism. Not at all. Neither Baader nor Dooyeweerd is pantheistic. Pantheism is the belief that the cosmos is God. Panentheism is the view that the cosmos is not identical to God, but that it is contained within God. Dooyeweerd speaks of “the religious law of concentration.” God is always more than his creation. Nor can we say that God had to create in order to fulfill himself. God freely chose to create. The world is dependent on God, but God is not dependent on His creation, except to the extent that he freely makes himself so, as in Christ’s kenosis and incarnation. Dooyeweerd emphasizes that Christ was subject to all laws, and not just the ceremonial law. But how can we hold to the idea of panentheism and still accept the doctrine of creation out of nothing? Both Baader and Dooyeweerd discuss the problematic issues around the idea of “creatio ex nihilo” or “creation out of nothing.” There cannot be a “nothing” alongside of God. All creation is out, from and towards God. There is no other Being from whom or from which creation could derive. Although the term ‘panentheism’ was coined by Krause after Baader, Baader uses a similar idea of Immanenz within God. And Dooyeweerd was influenced by De Hartog’s use of panentheist ideas, which in turn relied on Baader. What do you think are the biggest issues facing Dooyeweerdian scholarship today? Reformationals need to read Dooyeweerd again, without preconceptions of what his philosophy is about. For that, we also need better translations of Dooyeweerd. Dooyeweerd was so dissatisfied that he changed translators after volume I of the New Critique. Volume II was also unsatisfactory, so Dooyeweerd translated volume III himself. I have provided my translations of some of Dooyeweerd’s work online, including previously unpublished works that I found in the archives. I have tried to translate in a consistent way that reflects what Dooyeweerd says is most important. An even larger issue is that reformationals need to appreciate the importance of the history of philosophy. They often jump much too quickly to systematic philosophy. They start to re-write the philosophy in the form that they think it ought to have been stated instead of examining what Dooyeweerd really said. In that way, they frequently miss the heart of what Dooyeweerd is saying. Reformationals need to separate their theology from their philosophy. Dooyeweerd says that theology depends on philosophy. But most reformationals try to fit their philosophy into their existing theology. As a result, their Christian philosophy has become ‘immanence philosophy’ within the meaning of Dooyeweerd’s use of that term. Dooyeweerd says that without the idea of the supratemporal heart, they will end up affirming the autonomy of thought. Their philosophy and theology is then very hard to distinguish from the modernism that they want to criticize. Again, this will be very painful to admit. I read a lot of literature. I enjoy stories of mysterious interconnectedness, meaningful coincidence, complex hyperlinked plots, spiritual epiphanies, personal growth, extreme situations (exterior or interior) and unexpected grace. I enjoy the novels of Ian McEwan. For sheer pleasure in reading the English language, I enjoy Nabokov, and I have been intrigued by his theory of time. Without necessarily endorsing his views, I recommend the book Nabokov’s Otherworld by Alexandrov. It contains a fascinating account of how literature achieves the experience of epiphanies for the reader. For philosophy and theology, I have been reading Daniel Boyarin, a Jewish scholar who, like Alan Segal, tries to understand early Christianity in terms of Jewish merkabah mysticism. He regards Paul’s account of his ascent to the heavens as an early Jewish source. He also argues that the early church and rabbinical Judaism did not diverge until several centuries after Christ. His research relates quite well to Margaret Barker’s temple theology, and the way that the temple mediated between time and eternity, much as the aevum functions in Dooyeweerd’s philosophy. I have no doubt that our theology needs to be reformulated. André Troost has given one such attempt, which I discuss in my book. I have sung in several choirs. I like to listen to Glenn Gould’s Bach. I love the Lieder of Schubert and Mahler (and his song cycle “Das Lied von der Erde”). I like the jazz of Bill Evans and of Keith Jarrett. I have a grand piano and a couple of guitars, and although I will never play professionally, they give me pleasure. I did have a cello, but lost it in Calgary’s recent flood. For popular music, I listen mostly to older “confessional” songwriters like Leonard Cohen, Joni Mitchell, Nick Cave, Bruce Cockburn, Joan Osborne, Nina Simone, and Daniel Lanois. This is beginning to sound like an online dating site, but okay. I play about 6 hours of tennis a week, year round. I bicycle on the river paths near my home. I bought new downhill skis last year, and enjoy skiing at Sunshine and Lake Louise. I also bought a new set of golf clubs, and enjoy hacking away, although breaking 100 is still barely achievable. I jog up to 10km a day—up to the zoo to see the bears and back home. No marathons for me. I enjoy travelling with my children, and snorkeling off a nice beach. Closer to home, my garden brings me joy. I am an avid film buff, especially of older movies like those of Kieslowski or Bresson. I very much liked last year’s movie “Boyhood.” And I enjoy Danish Nordic Noir. “After the Wedding” is great. And the Turkish movie “The Edge of Heaven” is amazing. If you had one last meal what would it be? I recently made a batch of sorrel soup, or summer borscht, a recipe from my Mennonite heritage. My mother used to make it, and so I made it on Mother’s Day, in memory of her. The taste brought back an awesome number of memories (retrocipations), rather like the way that Proust’s madeleine (cake) allowed him to remember his past. So I think that would be important, along with some chunky whole grain bread, a good selection of cheeses, and a highly hopped West Coast style IPA. Has your Mennonite past influenced you? Of course. It continues to challenge me in its emphasis on community, simplicity of lifestyle and service for others, especially international aid. Its theology is less appealing. I wish that Menno Simons had followed the ideas of the Anabaptist Hans Denck instead of those of Melchior Hoffman, but that is another story. The fact that I have left my Mennonite roots has perhaps made it easier for me to explore other traditions. I was baptized in the Christian Reformed church and confirmed as an Anglican. I attended a Quaker high school, and the Quakers are perhaps still the group most congenial to my understanding of Dooyeweerd, with their emphasis on listening to the inner light and of religious self-reflection. But of course Quakers were highly influenced by Boehme, so there should be a connection to Dooyeweerd. So, what's the next project? I have several books I intend to publish on the topic of inter-religious dialogue. They are also consolidations and revisions of what I have written in the past. After that, I may try my hand at translating more of Franz von Baader. There is almost nothing of his work available in English. I have translated three of his articles online, but there are many more articles that are of interest. Hi Karl, I'll let him know. Thanks for dropping by, and for plugging the interview on your blog - much appreciated. Thank you, Karl Heinz. With respect to translations of Baader, you are right that there is a four page article in the book on Schelling. This is just a fragment of Baader’s Collected Works (16 volumes, including the index). You should be aware that although Baader influenced Schelling, they later had profound disagreements. Other fragments translated in English appear in books by Arthur Versluis and in Ramon Betanzos. I recommend Betanzos’s book “Franz von Baader’s Philosophy of Love” (Vienna: Passagen Verlag, 1998). And I have translated three of Baader’s works, including two articles on his philosophy of time (on my website).